Folding patio and room divider, privacy screen creates a wall, interesting indoor accent or provides seclusion to your favourite outdoor space. A folding room divider and privacy screen that conveniently balances fashion and function. Adds a fence to your yard without the fenced in look and feel. Need an attractive hide-a-way storage area, this does the job fast. Or simply section off space inside your home. With four panels you'll have ample surface to create the right amount of space and privacy you want at your pool, on your deck, in the garden wherever you need it. Cedar fence panels will enhance your outdoor living space while providing security and privacy for your family. These pre-fabricated panels are easy to install and are made from the highest quality cedar boards. Cedar contains natural preservatives that resist moisture, decay and insect damage thereby increasing the life of your fence. Have you considered cedar? Imitation is the sincerest form of flattery. Did you ever wonder why so many other products want to imitate Cedar? Man made materials cannot match the versatility,proven track record and environmental benefits of using Cedar. When specifying materials for your next project don't be disappointed, insist on Western Red Cedar. Used both outdoors and indoors for centuries, Western Red Cedar is renowned for its naturally occurring resistance to moisture, decay, and insect damage. Western Red Cedar is the ideal choice for many end uses and projects. Western Red Cedar's exceptional beauty brings warmth, character, and longevity to your outdoor living space. Western Red Cedar is carbon neutral, produces fewer greenhouse gases, requires less energy to produce than alternatives, and comes from a renewable, sustainable resource. Western Red Cedar is easy to install for both the professional and the do-it-yourselfer. Provide safety and peace of mind around your pool, garden, yard and more with our aluminum fencing system, AquatinePlus. AquatinePlus is a sophisticated component-based fencing system that allows for versatility and durability in its appearance and application. Assemble strong and bold pickets, add a gate and easily install on hard or soft surfaces. Keep any outdoor area of your home well protected and looking sharp. The clean and modern profile of the AquatinePlus fencing system blends nicely with any outdoor area to ensure that your view is left unobstructed. WARNING: The Aquatine.PLUS fence system has a height of 4'. For a pool fencing application: 1) Some local building codes require a system with a height exceeding 4', 2) The complete system is required, including Pool Gate (do not use Yard Gate). Building codes may vary. Always understand and comply with your local building codes. Folding Patio And Garden Privacy Screen Folding patio and room divider, privacy screen creates a wall, interesting indoor accent or provides seclusion to your favourite outdoor space. A folding room divider and privacy screen that conveniently balances fashion and function. Adds a fence to your yard without the fenced in look and feel. Need an attractive hide-a-way storage area, this does the job fast. Or simply section off space inside your home. With four panels you'll have ample surface to create the right amount of space and privacy you want at your pool, on your deck, in the garden wherever you need it. Folding Patio And Garden Privacy Screen is rated 4.4 out of 5 by 23. Rated 3 out of 5 by Pauline from Serves the purpose I bought this folding screen to hide the pool filter. The screen is heavy, which makes it sturdy, and I think it will last a long time. The colour is pretty bright--almost a sunny orange, which the natural colour of the wood, but it can be painted, which I will do eventually when it needs refreshing. The height is good, and better than other screens I have looked at. My only criticism is that the individual panel hinges move only one way, like door hinges. The screen would be more versatile if the hinges allowed the panels to be configured in whatever way suited the space. Overall, however, I am happy with the purchase. I wish it came in different widths, because I could have used one more panel. Rated 5 out of 5 by SUsan from Quality construction and versatility This screen is well made, versatile and gives me the privacy needed on my upper level deck. Rated 4 out of 5 by Chuck from Wood was not a high quality, knots, and splinters. ... Wood was not a high quality, knots, and splinters. Good design. Better material and it would be excellent. Rated 5 out of 5 by Mary from I am very pleased with the portable privacy folding screen, I would recommend it to anyone lookin... I am very pleased with the portable privacy folding screen, I would recommend it to anyone looking for instant privacy and it looks nice too. Rated 5 out of 5 by heat2313 from Great size, well built! Was a bit of... Great size, well built! Was a bit of a pain to stain paint it to match deck. But would buy again! Rated 5 out of 5 by TagGoulet from Gorgeous addition to deck! My home is on the market and I was receiving feedback that buyers felt my deck wasn't private enough (there are condos behind mine). 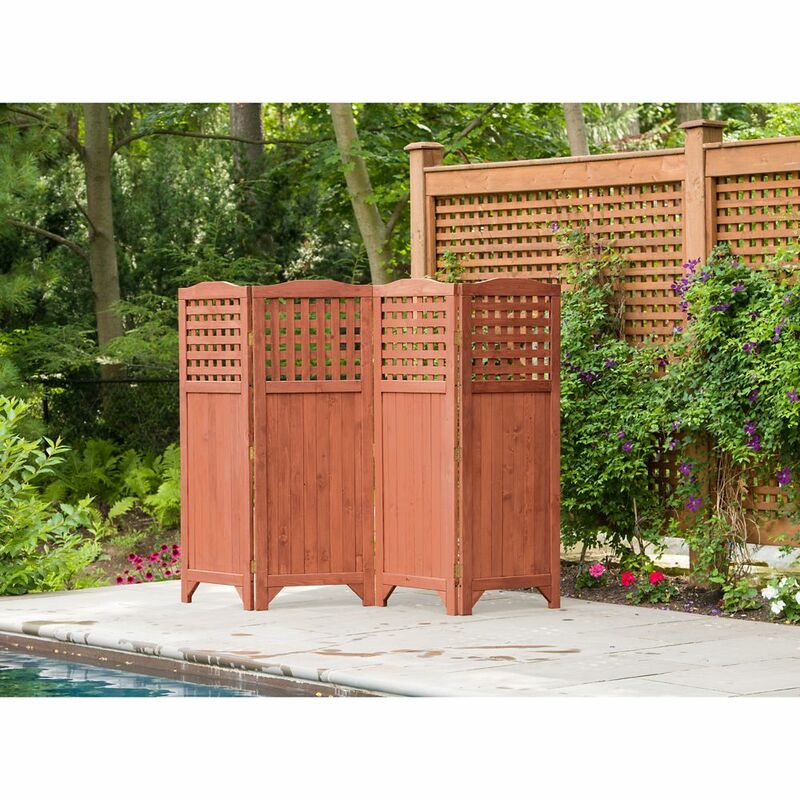 I bought two of these and they are a beautiful addition to the deck, providing more privacy, looking good, and still allowing plenty of light through the latticework at the top. I recommend them! Rated 4 out of 5 by PrivacyQueen from Only issue is that a light wind will blow it over, therefore it has to be positioned properly on ... Only issue is that a light wind will blow it over, therefore it has to be positioned properly on a level surface and with a support on either side ( like a heavy plant pot). I like the overall construction of it but do plan to paint it. And I like the height for my purposes. The screen is very versatile and I can move it to different locations from my patio to the yard as needed— it weighs about 50 lbs so a lady may not move it easily on her own. Is there any finish on these or can you stain directly over the wood? All of our products already come with an acrylic based outdoor grade stain/sealer applied. If you wish to apply additional finish, we recommend an acrylic based outdoor grade stain you can find at a local paint store. Answered by: Leisure Season Ltd. Does this screen have reversible hinges? I want to be able to configure it in a square shape around an urn on my deck to help plants to overwinter.